Mads Mikkelsen is one of the best cinematic villains on screen today. The Danish actor has played bad guys in Casino Royale, Hannibal and Marvel‘s Doctor Strange. But as the actor travels to a galaxy far, far away in Rogue One, he has a new role – that of the hero… or is he? Mikkelsen plays Galen Erso, a brilliant scientist who is key to making the super laser of the Death Star work. He’s also the father of our heroine, Jyn Erso. But when they are separated by the Empire’s Director Orson Krennic, it sets Jyn on her hero’s journey. 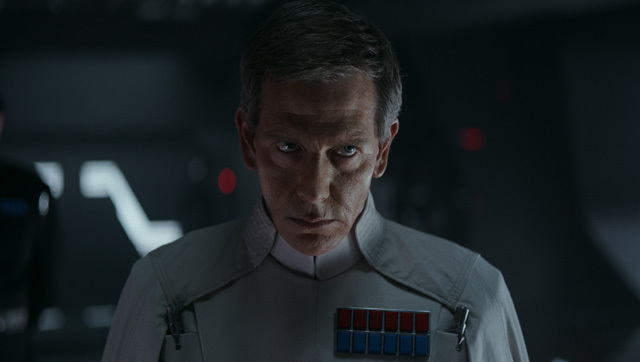 Krennic is played by Australian actor Ben Mendelsohn. While he is just about to become familiar to American audiences, he has long been a star Down Under. He’s had roles in Quigley Down Under, Australia, Animal Kingdom, and The Dark Knight Rises. After playing the villain in Rogue One, he’s about to have one of the biggest roles of his career in Steven Spielberg’s Ready Player One. But first he has to face Jyn and the Rebellion. I spoke with Mads Mikkelsen and Ben Mendelsohn in a joint interview, in which I asked the actors about working with Darth Vader, the back story between their characters, if it’s more fun to play the hero or the villain, and more. And the biggest surprise for me was finding out just what a lifelong Star Wars fan Ben Mendelsohn truly is. Felicity Jones stars alongside Mads Mikkelsen, who plays her father, Galen Erso. Diego Luna (Milk) stars as Captain Cassian Andor, with Donnie Yen (Ip Man, Blade II) as the blind spiritual warrior Chirrut Imwe, Jiang Wen (Let the Bullets Fly, Devils on the Doorstep) as his heavily armored best friend Baze Malbus, Alan Tudyk (Firefly) as the droid K-2SO, Riz Ahmed (Nightcrawler, Four Lions) as the Rebel pilot Bodhi Rook, plus Forest Whitaker (The Last King of Scotland) as Saw Gerrera, a character first introduced in Star Wars: The Clone Wars, and Ben Mendelsohn (Bloodline, Mississippi Grind) as the film’s main antagonist, Director Orson Krennic. The Walt Disney Studios will release Rogue One: A Star Wars Story in theaters on December 16, 2016.